Richard Stevens is a typical young man, with energy and ambition. The island will never be too small for him as it is literally his workplace. During the last 2 years, Richard has set up and run Jersey Seafaris, a fast growing venture taking people on boat trips around the island … and a little further away. The Minquiers, Les Ecrehous, Les Iles Chausey are all names that make us islanders dream as one needs a boat to get to them. Jersey Seafaris has it all; the RIB (Rigid Inflatable Boat), the experience and the enthusiasm. Jersey Seafaris is a great name! What comes first for you: Jersey, the sea or the safari? I think it has to be Jersey, I was born and raised here and love the place! The main reason for that love revolves around the sea and our magnificent coastline and offshore islands. The fact you can see dolphins seals and a great variety of birdlife helps! The destinations you offer at Jersey Seafaris require an excellent and precise knowledge of the island’s waters, how did you gain that experience? Before I could walk my family had me on a boat! I grew up sailing around the Channel Island waters and further afield. Since I was 16 I have been lucky enough to have my own boat, places like Les Ecrehous and Les Minquiers require a great knowledge of where all the rocks are, when they are covered by the tides and the sea conditions – over time I have learnt a great deal. Boating around Jersey is fascinating, conditions can change in minutes you are always kept on your toes! Which is your favourite destination? Tricky question! So many amazing spots around Jersey, but it has to be somewhere away from the people, a secluded sandbank only showing on a big spring low tide like L’Ecreviere near Les Ecrehous. Spotting a dolphin is always a magical moment, how common is it at this time of year? The bottlenose dolphin that we most regularly see live in the area, it is estimated that there are around 100 or so that inhabit the Jersey waters. You can see them at any time of the year – but they are easiest to spot on calm days and most likely around the east coast of Jersey. Tell us about a memorable trip that you made with customers recently? Our first trip to Les Ecrehous of the season was incredible. You usually expect the first trip to be cold and a bit bumpy. The sea was flat calm, the sun shining and there were no other people on the islands – magical! The water was turquoise like the Caribbean or the Med too. To top it off on the way back to St. Catherines there was a pod of about 30 dolphins right at the end of the Breakwater as we came in! Do people need any kind of seafaring experience or are you happy to take anyone on board? There isn’t any need for any experience on boats. We advise that children should be at least 5 years old, it is not advisable for people with a history of back problems or pregnant women. Your love of the outdoors made you combine work and pleasure, are you involved in any environmental projects? 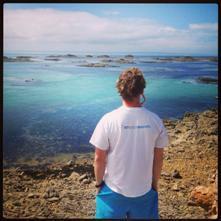 We work very closely with Jersey Aquatic Discovery our partner charity. Their aim is to encourage an appreciation, awareness and understanding of the marine environment and support its conservation and sustainable use. Their philosophy is something we like to put across to our customers on our seafaris. When you are not on the water, where can we find you? By the sea! Either out on the boat for pleasure or down the beach surfing or any other water based sport! Maximum speed with the RIB in glossy conditions? Sailing, it gives you a much better chance of exploring far away places without having to worry about refueling and the costs! This entry was posted in My Jersey and tagged Jersey Seafaris. Bookmark the permalink.